After a week of practice, Indy 500 Pole Day for the 96th running of the great open wheel event had finally dawned on the Brickyard. 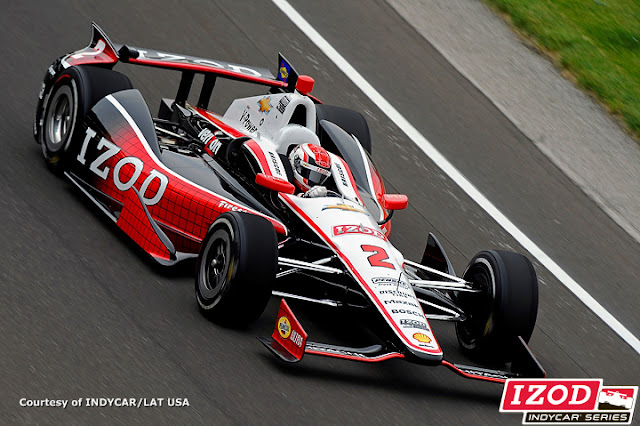 Testing out the all-new Dallara DW12 race cars paired with either Chevrolet, Honda or Lotus engines, the time trials for the Memorial day Sunday Indianapolis 500 race is the most crucial laps teams and drivers will set on the racetrack so far. Through Saturday afternoon, the first 24 spots for the 2012 Indianapolis 500 were settled as Dallara DW12 race cars took the race track for the best combined four-lap run. On a hot race track 2.5-mile race track, teams slowly began to log lap times. For Indy 500-only drivers Sebastian Saavedra, Michell Jourdain Jr and Townsend Bell, efforts of securely qualifying into the 2012 edition of the Indy 500 were realized with top-24 times around the race track for Pole Day. Last competing in an United States open wheel racing car in 2004, Michell Jourdain Jr recorded a 222.893-mile per hour average speed in a Rahal Letterman Lanigan Racing Honda-powered entry. Good enough with a 22nd place starting spot, the Mexican driver Jourdain Jr will start two spots behind Townsend Bell but two ahead of Sebastian Saavedra. Another impressive qualifying effort that involved getting an underdog race effort into the Indianapolis 500 was the run by Alex Tagliani with the Bryan Herta Autosport team. The reigning Indy 500-winning team, the Bryan Herta Autosport with Curb Agajanian entry skipped the last IZOD INDYCAR Series race in Sao Paulo to focus on defending their Indianapolis Motor Speedway success in 2012. The decision to miss a race was also reflective on Lotus removing the race team from their powerplant alliance. Bryan Herta Autosport returned to Indy with Honda power and Alex Tagliani locked the car into the field. Starting 11th place for what will be the fourth row of the 2012 Indianapolis 500, the #98 car recorded a speed of 224-mile per hour flat. At 4:30 pm, the fight for the pole of the 2012 Indianapolis 500 was amongst the drivers who will start on the first three rows of the event. The Fast Nine session gave eight Chevrolet-engined competitors and one Honda engine race team a chance to claim the top spot in the most prestigious race in the world. The #26 Andretti Autosport car of Marco Andretti performed the first completed qualifying attempt for what was a 225.456 mile per hour average speed. Six minutes after Andretti’s time, the next competitor taking to the 2.5-mile oval was Ryan Briscoe for Team Penske. Briscoe’s #2 Chevrolet-powered Dallara would drastically better Marco Andretti’s best by more than a mile per hour average. Recording a four-lap average speed of 226.484, Ryan Briscoe would survive the charges of Team Penske teammates Helio Castroneves and Will Power initially. With 50 minutes to go, the biggest challenge to Briscoe’s pole position emerged from the Andretti Autosport team. Wheeling the #27 GoDaddy-sponsored Dallara-Chevrolet, Canadian James Hinchcliffe took to his Fast Nine time trial with an initial lap of 226.934 miles per hour. However, a slight cool down in the remaining three laps by Hinchcliffe’s car would result in a narrowly positive outcome for Ryan Briscoe. An overall four-lap effort of 226.481 miles per hour for James Hinchcliffe, the #2 Roger Penske-owned race machine of Briscoe would hold the pole by just 0.003 miles per hour. The pole for Ryan Briscoe for next Sunday’s Indy 500 is the first for an Australian driver, the top starting position is the 17th for Team Penske. Penske’s pole position will be joined by second row starts for the team’s other two cars. Will Power starts 5th while Helio Castroneves will start 6th for the 2012 Indianapolis 500. With the top 24 fastest entrants with berths in the Indy 500, the remaining 9 cars will have to log times on Sunday’s Bump Day qualifying settling the 33-car field.